Great all around bowl for cereal, soup, and salads. How perfect for today’s casual farm house style! A great lightweight and durable classic. 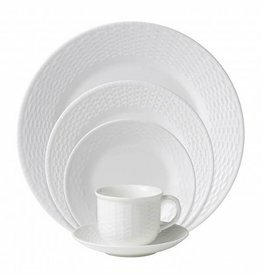 Includes Dinner Plate, Salad Plate, Bread and Butter Plate, Cup and Saucer. Everything you need for starting out. A classic farm house look! Includes dinner plate, salad plate, cereral bowl, and mug. Very sturdy yet lightweight tableward. Works in so many of today’s trends… a true classic. We match Wedgwood sale pricing! Perfect for ice cream, cereal, also serving salsa and other sides. Absolutely love this classic for today’s farm house style.